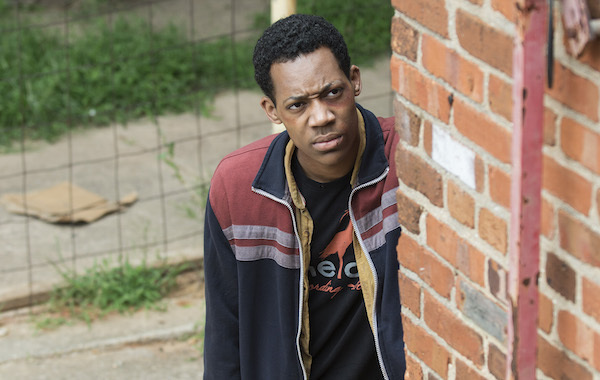 Spoilers if you're not caught up on The Walking Dead through "Spend." We're down to the final few episodes of The Walking Dead, so death is inevitable. Then again, this season hasn't exactly been sticking to any kind of formula, with Bob and Beth meeting their demise as the first half of Season 5 ensued. Tonight, we saw the dismal exit of Noah. It was supposed to be the beginning for him. Early on in "Spend," we saw him expressing an interest in learning how things were built. He was given a notebook that he barely had the chance to begin filling in. And then he was gone, dying in the worst way possible for this series. And The Walking Dead certainly didn't spare us any gore in showing Noah's face getting ripped open. Noah and Glenn were holed up in one wedge of a revolving door that was surrounded by walkers. Alexandrian Nicholas was tucked away in another wedge, fresh off abandoning Aidan. Eugene rose above his own fear and created a very loud diversion to draw the outside walkers away from the door, giving Glenn the opportunity to try to break the glass so that he and Noah could get out, after which Nicholas would be able to rotate the door and let himself out. If all goes to plan, everyone lives (except for all the dead people already dead). The walkers on the inside of the building were still a threat, and the moment Glenn started applying pressure on the door, Nicholas panicked and started to push his way out, effectively exposing Glenn and Noah to the inside-Walkers. Noah was dragged into the building and then pressed against the glass where he was torn apart by the hungry zombies. Glenn was able to get out after that, but not before having a brief and devastating meltdown over the brutal loss of his friend. He made Nicholas pay for it with a couple of hard punches before they returned to the compound. We might joke about the revolving door being a metaphor for characters in The Walking Dead, especially for someone like Noah, who was only just becoming a part of the group. I'm not a fan of revolving doors in general, but I have to say, points to the writers for finding a really creative and devastating way to use one in a zombie situation. Noah wasn't around for very long, but he was an interesting addition to the group and I wouldn't have minded him sticking around a bit longer. What's worse, it brings back a bit of grief for Beth. She liked Noah and would've wanted so much more for him. Noah's death is one more indication that Alexandria isn't the paradise it's cracked up to be. We've seen these survivors face off against hostile people who've threatened their lives. While the people of Alexandria aren't hostile (well, most of them aren't), they aren't prepared for what exists outside the safety of their walls. Some of them are cowards who panic in the face of walkers. Trust is crucial in this world, and it's bad enough when there are hostile people like the Governor and the cannibals out there, but in some ways, these Alexendria people might be worse. They're not bad people, and they've welcomed Rick's people in with relatively open arms, but they're proving to be unreliable and untrustworthy in the field. Granted, trust is something that needs to be earned, but Nicholas' panic and abandonment cost Noah his life. Eugene overcame his fear in order to help his friends. I might defend Nicholas's panic by saying that he barely knows Glenn and Noah, but Nicholas left Aiden to die also, and as Aiden revealed to Glenn, they've panicked in the past. Tara's also not doing so well, but the fact that she didn't die on the scene leads me to think she'll pull through. Hopefully, anyway. In the meantime, RIP Noah. We'll miss you. How will Noah's death affect the group? We're already starting to see problems for Rick's people at Alexandria, including Carol's discovery that Pete's (presumably) hitting his wife and possibly their son. Of course, Carol wants that dealt with. She's faced domestic abuse firsthand. Meanwhile, Gabriel decided to turn on Rick and his group by telling Deanna that none of them deserve this paradise. That's bad enough, but then Maggie overheard it, so it's likely it'll get around. Two more episodes -- including one extra-long finale -- left in Season 5. Things can't possibly get any worse, right? Heh.